THE SAINTS were dealt their first league defeat of the season on Saturday, after a bad day at the office against an experienced and streetwise Golspie Sutherland. A calamitous opener was rounded off by two quick fire late goals to give Andrew Banks' visiting side all three points in their first game. With Fort William loanees Glenn Fell and Liam Taylor both recalled on Friday, Ryan Day moving to Glasgow and Garry Macleod and Scott Miller also absent, Stuart Ross was forced into a number of changes. Trialists Martin Clark and Barry Kenny came in to the defence, at right wing back and centre half, while Jake Lockett made his first competitive start up front. Cameron Mackintosh was also named as a trialist, taking up a position in the midfield. Unsurprisingly, Golspie Sutherland were organised from the get go and they pressed the Saints hard in search of an early goal. Unfortunately for the Tain men, Golspie had to do little for their first goal after ten minutes of play, when Alexander Macleod pounced on a miscommunication between the defence and Steven Martin to nip in and slot home. There were few chances for either side in a cagey first half which was mostly contested in the midfield. While the early goal didn't rock the Saints' determination, Stuart and the team will have felt aggrieved to have a goal deficit at the end of the first half. The Saints played some good football at times, and were unlucky not to test Stephen Mure in the Golspie goal during the first period, Andrew Miller and Jake Lockett thwarted on a couple of occasions when breaking clear. Settling into the game more as the second half began, the search for an equaliser continued. As has been the case a few times already this season, the introduction of Steven Learmont injected some verve into the forward line and coming after an hour's play, he was proving a tough customer for Golspie on the right wing. On more than one occasion he played half time substitute Michael Newlands in on goal, but the forward couldn't get the killer shot away to find the equaliser, partly due to solid goalkeeping from trialist Stephen Mure in the Golspie goal. Learmont got in on the action himself with a stinging angled shot which Mure turned away. At the other end, Steven Martin once again showed his capability with a number of crucial saves to keep the Saints in the game, with John Skinner, Barry Kenny and Will Ross also required to come to the rescue as Golspie frequently broke on the counter, showing regular signs of their quality up going forward. The Saints had their head in their hands on 75 minutes when Newlands found himself through on Mure just yards from goal. Newlands forced a save, but as the ball fell to Joe Sutherland to prod home the open goal, the left wing back sent it painfully into the side netting. An excruciating moment for St Duthus as the wind could be felt leaving their sails. Then came the killer blow. 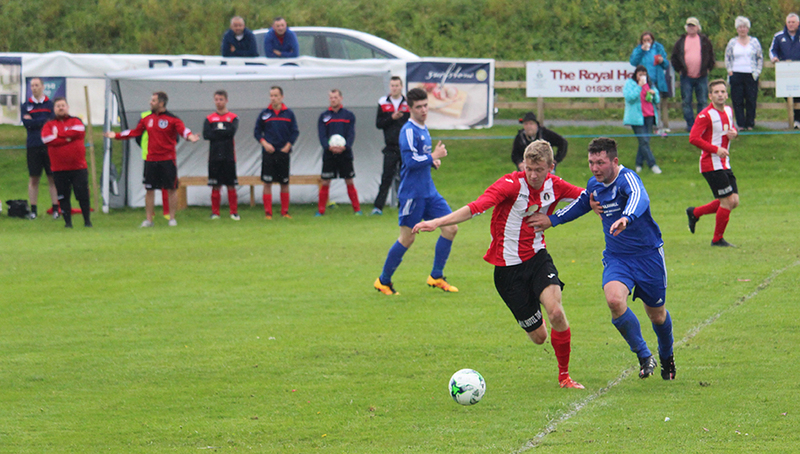 Two goals in quick succession put the Saints to the sword and ended the game as a contest in the 78th and 79th minute. First, a corner from Colin MacRae flew low and hard across the face of goal and somehow found itself creeping into the net directly from the set piece. 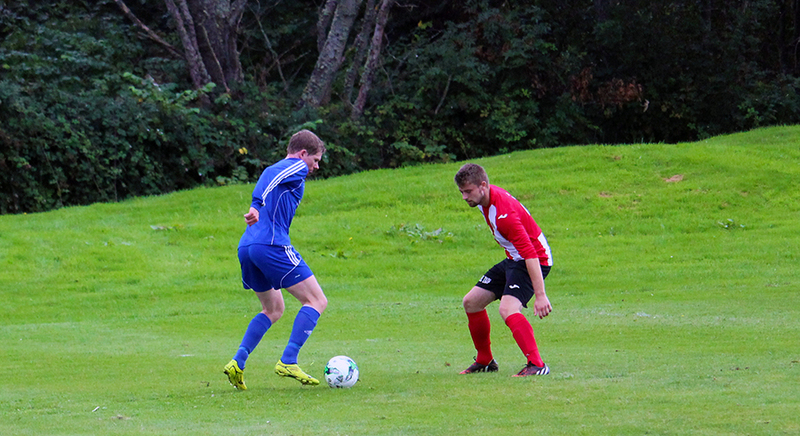 Just a minute later, Golspie's imposing number nine, Lucasz Geruzel, added the final touch on the counter attack. The Saints drop a place in the league as Halkirk creep above the Tain men on goal difference. St Duthus remain in the top half of the table though and next week they welcome the current champions to the Links for what should be an entertaining game between two sides who are in similar form. Our sponsors for yesterday's match were Metalwork UK. Thank you their managing director James Harkiss for his kindness.